A camera aboard NASA’s New Horizons spacecraft has started generating tantalizing views of Pluto rotating on its sharply tilted axis, presenting patches of bright and dark material as it spins around a pole that appears to be covered with a cap of ice. Using “deconvolution” techniques developed to sharpen the images of the Hubble Space Telescope before the spherical aberration in its primary mirror was corrected by spacewalking astronauts in 1990, the New Horizons team has produced still images and animations based on those images with slightly better resolution than the Hubble. via New Horizons Delivering Pluto Imagery With Better Resolution Than Hubble | Space content from Aviation Week. Image & Illustration Credit & Copyright: NASA/JHUAPL. 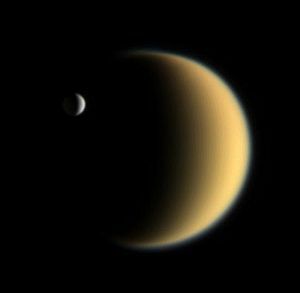 With the burn up of Venus Express in late 2014-early 2015, one of our two eyes to the inferior (inner) planets was extinguished. Unfortunately, it seems that this week, by the end of April, after nearly 11 years in space and more than 4 years and 4,000 orbits around Mercury, MESSENGER will meet its fate as well. via The Messenger Must Die! | DanSpace77. via Chandra X-ray Observatory delivers new insight into formation of star clusters | Astronomy.com. The shower is the May Camelopardalids, caused by dust from periodic comet 209P/LINEAR. No one has ever seen it before, but this year the Camelopardalids could put on a display that rivals the well-known Perseids of August. The best time to look is during the hours between 6:00 and 08:00 Universal Time on May 24th or between 2 and 4 o’clock in the morning Eastern Daylight Time. That’s when an ensemble of forecast models say Earth is most likely to encounter the comet’s debris. North Americans are favored because, for them, the peak occurs during nighttime hours while the radiant is high in the sky. via A New Meteor Shower in May? – NASA Science. For years researchers have been debating whether Enceladus, a tiny moon floating just outside Saturn’s rings, is home to a vast underground ocean. Is it wet–or not? Now, new evidence is tipping the scales. Not only does Enceladus likely have an ocean, that ocean is probably fizzy like a soft drink and could be friendly to microbial life. via A Fizzy Ocean on Enceladus – NASA Science. 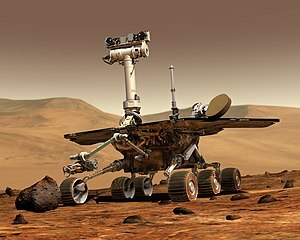 “NASA will begin transmitting commands to its Mars exploration rover, Spirit, on Monday as part of an escape plan to free the venerable robot from its Martian sand trap. “MOFFETT FIELD, Calif., Sept. 11 /PRNewswire-USNewswire/ — NASA has selected a final destination for its Lunar Crater Observation and Sensing Satellite, or LCROSS, after a journey of nearly 5.6 million miles that included several orbits around Earth and the moon. The mission team announced Wednesday that Cabeus A will be the target crater for the LCROSS dual impacts scheduled for 7:30 a.m. EDT on Oct. 9, 2009. The crater was selected after an extensive review as the optimal location for LCROSS’ evaluation of whether water ice exists at the lunar south pole.